One girl broadcasted some perspective to her fellow students. Keira Meikus, a 9-year-old student at Our Lady of Sorrows Catholic School in Homewood, Alabama, was diagnosed with autism when she was 4 years old, ABC News reported. 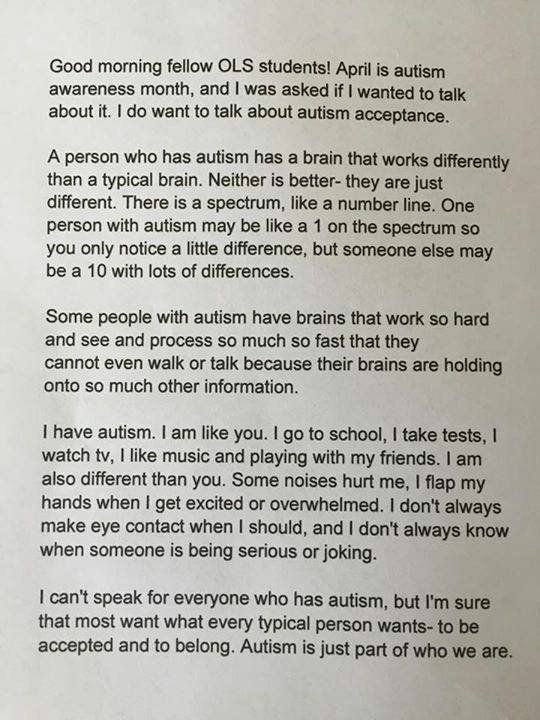 In honor of April’s Autism Awareness Month, the fourth-grader recently delivered a powerful speech regarding her condition to the entire student body during the morning announcements. Keira Meikus, delivering her speech earlier this month. She also told her fellow students how she’s individually affected by the disorder. Ultimately, her goal was to get students to become aware and more accepting of those with autism. And according to principal Mary Jane Dorn, that’s exactly what the speech did. The 9-year-old’s message has since moved people beyond the walls of her school. Various media outlets have picked up the fourth-grader’s speech and Dorn hopes that Keira’s story will uplift others with autism.